Look, we get it – it’s hard to get too excited about ANOTHER Super Bowl with the Patriots playing. (Wing Shack Hot Take: Patriots will LOSE this game – you heard it here first) But we choose to look at it a different way – this year we get to relax with our friends and family and watch the game completely stress free! (Assuming you aren’t a Patriots fan, because, like we said, they are going to LOSE) Instead of holding our breath and focusing on every play, we can enjoy the revelry of a great Super Bowl party (indulging in great food, great drink, and great company) without really caring about the outcome! As if you didn’t have enough reasons to have wings for the Super Bowl, we want to let you in on a little secret. All day on the Super Bowl we will be putting the following envelopes in our to-go bags. The offer is void if you don’t bring us the envelope back still sealed. 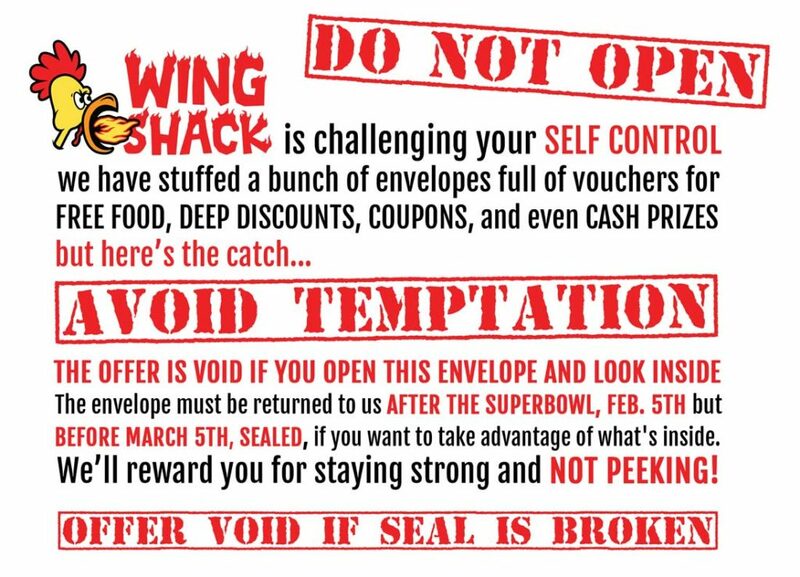 That’s right – there is no peeking to see what’s inside… we have to open the envelope for you at your local Wing Shack for the offer to be valid! So make sure to exercise self control and don’t peek at the offer inside. Bring it back to us on your next visit to the Wing Shack still sealed (before March 4th, 2018) and enjoy a very special gift from the Wing Shack! And, as always, keep an eye out for the last Guess the Score post of the season on Facebook! We will have a substantial amount of FREE Wing Shack on the line – that might come in handy next season when the Broncos are contenders once again!